Rose lovers love them in all colours; it is a kind of joy for the eyes when they see various colours of fresh roses. 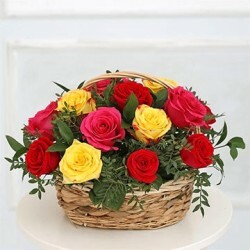 Delight your loved ones’ eyes with beautiful fusion of three colour roses by ordering Giftjaipur’s beautiful mixed colour rose basket for them. This amazing combination of different colour roses befits all the occasions and suits all the relations. This eye-catching variety of roses will be enough to surprise your friend or relative on their special days. This specially designed basket with 15 roses of three different colours will surely capture the spirit of joy and happiness on the special day of your loved ones. Their freshness and fragrance will freshen up their mood and brighten up their day. Order this joyous and bright combination of roses and send it to your loved ones on their special days to make them smile and feel unique for you.